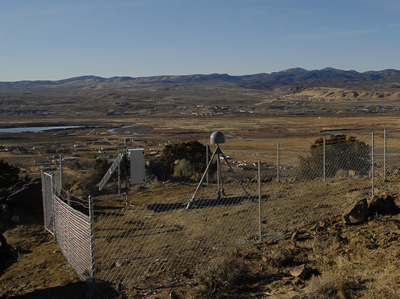 Three new GPS sites were added to the existing Basin and Range Geodetic Network (BARGEN) in north-central Nevada as a response to recent findings in data indicating the existence of coherent sub-continental scale transient deformation signals. These new deployments employ the use of the standard deep-drilled braced monuments (DDBM) widely used by the existing BARGEN and Plate Boundary Observatory (PBO) networks, among others. These sites are augmenting several other new sites in the region that are part of the PBO network. Figure 1 - LACR, Last Chance Creek, BARGEN GPS site.